Here’s the thing: We get giddy over details and are addicted to the over-the-moon feeling we get from visually transforming a space. This is where we shine. Not one detail is ever overlooked, and we strive to make your wedding a true testimony to your individuality and personal style. Whether you like to be hands-on, are a crafty bird, like to dabble in the styling process, or would simply rather we take the reins on all matters design and decor, we’ll work with you to ensure your wedding is cleverly and seamlessly executed. We’ll discuss all the fun details over coffee and have an opportunity to explore our different packages in depth. Contact us for a complimentary consultation. This service is for the couple who is in need of full wedding coordination – from the planning stages up until implementation. We’ll handle the many details involved in planning a wedding, such as budget allocation, vendor recommendations and bookings, wedding day management, and styling and design. 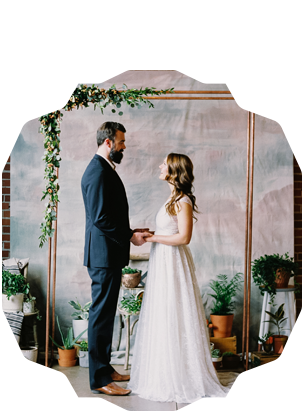 This service provides support for couples who have a vision for their special day, but aren’t sure how to bring the vision to life. We promise to plan the wedding of your dreams, while making it a stress-free and fun experience. This service is perfect for couples that have a solid handle on the planning logistics, but need a designer to come in with a creative game plan. A wedding styled by Kismet & Clover means we will work closely with you to design your wedding based on looks and trends you love. From the colour palette, to mood boards, to the must haves and sourcing materials, we take all creative aspects into consideration and propose a design that is perfectly aligned with your favourites, all while ensuring that the styling is executed beautifully on your big day. Month and day-of coordination is ideal for couples who feel confident about all aspects of planning and styling, but would like the assurance of a wedding professional to help oversee the final weeks leading up to the wedding. We will take on all daily logistics so that you can fully enjoy your wedding day, trusting that the day-of logistics are in our capable hands.